Stretch marks has often been a reason to be self-conscious. It is natural to have them but to have those kinds that are so dark, they really look dirty is another thing. Laser surgery in removing stretch marks is so pricey. Why pay hundreds when you can remove those pregnancy scars/working out scars yourself? Often times, stretch marks appear on parts where fat is stored. These are the abdomen, thighs, buttocks, upper arms, under arms and breasts. Women who had just given birth have theirs as reddish marks which become light purple later on. These can also be obtained through physical activities such as working out. Also, if your weight balloons up and down on the weighing scale, your skin is often stretched and the collagen normally produced is disrupted, resulting to discoloration. 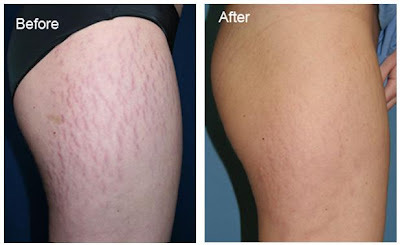 Realistically, stretch marks cannot be removed instantly. According to doctors, these are already scars. What you can do is to make them less noticeable by lightening the dark spots. The most common home remedy in removing stretch marks quickly is cocoa butter. This has been tried and tested by mothers who had recently given birth. It is also possible that the massaging action of applying the cocoa butter attributes to the less noticeable stretch mark. Another solution you can try is to exfoliate. Choose a product that will work best for you. After exfoliating, use a good lotion on the scars. Some have even tried squeezing a Vitamin E capsule open and applying the liquid to the area with the stretch marks. According to them, it worked. You can also use olive oils and coconut butter. Thoroughly massage these topical ointments on the area where the stretch marks are located. Do this religiously and regularly. Sooner or later, you will see results. If you prefer those you can buy in the drug store, there are a number of products you can use. An example is the Palmer’s Stretch Marks Cream. It is herbal based and is quite safe and effective in removing those unwanted stretch marks on your thighs, buttocks, stomach and breasts. It also restores your skin to its original texture. Stick to one solution. Do not go from one home remedy to the next – as to this might have additional side effects. Make up your mind which remedy you would like to try and stick to it for at least 6 to 12 weeks. If there are no improvements, then you can try another one. Prevention is better than cure and the most effective way for you to not get stretch marks is to exercise. By doing so, your muscles and your skin remain firm. You can also eat foods that are rich in proteins, Vitamin C and Vitamin E. Drink lots of water because they can also help your skin to be healthier. Stretch marks are not hazardous to one’s health though. Having them does not mean that the person will not be able to function properly. It is normal for everybody to be concerned on how they look and although these stretch marks are located in areas that are not usually seen, the fact that you still have them can lessen your confidence. We all have a right to feel good about ourselves and if lessening the possibility of having our stretch marks noticed, then so be it. If it also means removing our stretch marks fast, then go for it.